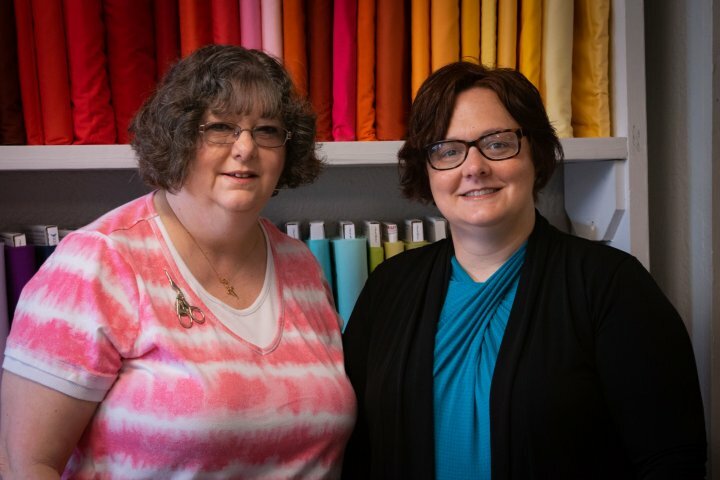 Warm N Cozy was founded with just 2 members; Mother, Debbie and Daughter, Danielle. In 1997, Danielle made plans to get married. Debbie felt Danielle needed a quilt as a wedding present as had been a tradition in the family, but ran into a problem; Grandma Carol who had been the maker of quilts had passed away. So Debbie set out on a mission to learn how to quilt. Debbie bought a book called "Quilt In A Day" by Eleanor Burns and made a king size Log Cabin quilt. She got the bug and made a quilt for herself and one for her step-daughter, but decided to have that one machine quilted by a professional. She contacted a lady in her town and found out the lady no longer quilted, but her machine was for sale. This was Debbie's first long arm quilting machine. Debbie turned her hobby into a small business and quilted for other people first from home and then she moved into a quilt shop. Then in 2010 she moved it back home and eventually into the garage in storage. During this time, Danielle went to work for a national chain shoe store. She started off as a part time sales associate and during her 20 year span became a multi-store manager running the highest volume store in the Midwest. After many long years in retail, she had decided that she had missed enough time with her family and began to look for alternatives. Then Danielle made the hard decision to leave her job and return to school. She took the two classes that she needed to finish her degree and spent the summer with her kids. During that summer Danielle started quilting with Debbie on Monday evenings at their church making charity quilts. Many times they discussed how quilting was a wonderful therapy and how it brought sanity back into their lives. Then one Monday evening the air conditioning had gone out in the church so they canceled their weekly meeting. Danielle's husband, Jason, noticed how down she was that it had been canceled. He said, "You are really bummed out about this. Why don't you just open up a quilt shop?" The next quilting session Danielle shared what Jason had said to her and Debbie said, "Don't even go there unless you really mean it. We could do this in a heart beat!" Ideas started bouncing around, business plans were made, and within a month they put a deposit on a storefront on Main Street in Columbia, IL. They opened the shop and haven't looked back. Since opening in 2016, Warm N Cozy has grown. The shop moved from the original location into a larger space, still on Main Street. In 2019, Warm N Cozy was named the Family-Owned Small Business of the Year for Illinois by the Small Business Association. They continue to grow and thrive, focusing on faith, family, and community.